The Larder has been ranked by the Independent as the 12th best coffee shop in the country. A licensed cafÃ© and very tempting deli, the owners of the World’s Larder work with small, artisan producers for everything from their delicious coffee to their daily bread (delivered each morning from French bakery Boulangerie Jade). Alan calls it a ‘great little star in the east and brilliant all-rounder’. 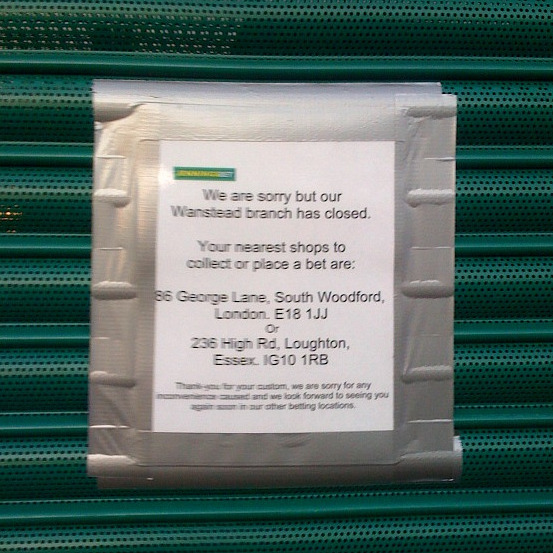 Meanwhile bookies Jenningsbet, which became the High Street’s third bookmakers when it opened in the former Woolwich Building Society office, has ceased trading at Wanstead. A sign on the shutters refers customers to its branches elsewhere. Jenningsbet was the subject of a Wanstead Society campaign when it opened with an illuminated sign; planning permission was later refused for it. One tweeter believes it’s going to become a cafe. Much to-ing and fro-ing in Labour party circles has resulted in former MP and union official John Cryer being selected as the candidate to follow Harry Cohen as Leyton and Wanstead MP. TV historian Tristram Hunt was one of the losing hopefuls. And Wanstead’s most notorious feline resident, Pebbles, better known as Susan Boyle’s cat, seems to be on her way west. The Sun has reported that SuBo is leaving Lothian to buy a flat in Chelsea, meaning cat and owner can be reunited.